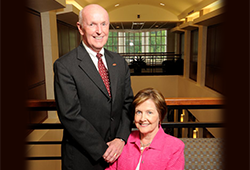 The generous gift from Elon trustee, alumnus and parent Jack R. Lindley Sr. '56 P'83 and his wife, Dorothy C. Lindley P'83, of Burlington, North Carolina, will provide valuable funding to help secure the university's future. In recognition of the gift from Jack and Dot Lindley, Elon will name the second-floor lobby in Richard W. Sankey Hall the Jack and Dorothy Lindley Gathering Space. Sankey Hall is the new three-story, 30,000-square-foot facility under construction on the north end of the McMichael Science Center parking lot. The building will include the Doherty Center for Innovation, Creativity and Entrepreneurship, Chandler Family Professional Sales Center, a Design Thinking Center and Financial Education Center, which are all available to students in every major, school and college. The Lindleys were excited to make their second estate gift to Elon. "I love Elon," Jack Lindley said. "I was a student when Elon was very small and to see the university grow substantially and become a national institution has been amazing and makes me proud. Elon has been blessed with great leadership, and we are pleased to have been a part of this growth." "Elon has given us a lot of opportunities that we would not have had otherwise and has enriched our lives tremendously," Dot Lindley said. The Lindleys are among Elon's most loyal donors, making gifts to support scholarships, athletics and the Ernest A. Koury Sr. Business Center. In 2008, the couple made their first estate gift to Elon, which will endow the Jack R. and Dorothy C. Lindley Scholarship in the future. Their most recent estate gift will provide important unrestricted funding in the future to support the university's top priorities. The Lindleys are members of Order of the Oak, which recognizes donors who make estate and other planned gifts to Elon. Jack Lindley serves as chairman of Industrial Paper Products and has been an enthusiastic supporter of his native Alamance County and Elon. He has served as an Elon trustee since 2001 and is the recipient of the university's Frank S. Holt Business Leadership Award and the Distinguished Alumnus of the Year award. The couple's son, Jay Lindley, is a 1983 Elon alumnus. "I love Alamance County and believe that education is important to the economic future of our community and to the next generation," Lindley said. Estate and other planned gifts provide a vital source of funding for Elon's future. To learn more about how you can make a difference at Elon with a planned gift, please contact Carolyn DeFrancesco, director of planned giving, at (336) 278-7454 or cdefrancesco@elon.edu. You can also visit elonlegacy.org.